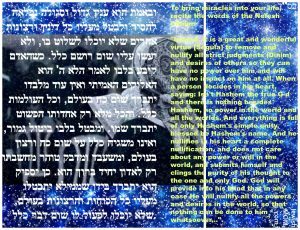 Rabbi Nivin suggested a few months ago that if we want to connect with G-d on a more constant basis, and see more miracles in our lives, then he would recommend reciting the Ain Od Milvado segula written by the Nefesh HaChaim (Rabbi Chaim of Volozhin). So I started doing just that, every day after davening, and since focusing every day on these words declaring ONLY Hashem runs the world, and NOTHING and NOBODY has any power over me except Hashem, I’ve been experiencing an unusual increase in experiences of “that-was-just-too-weird–that-COULD-NOT-have-just-happened!” Divine Providence in my life. “The Brisker Rav, Rav Yitzchak Zev Soloveitchik, was a descendant of Rav Chayim of Volozhin — the author of the Nefesh HaChayim. 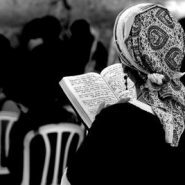 “He testified how the statement of faith recorded in the Nefesh HaChayim literally served as a guide through his life. When he was a young man, Reb Velvel, as he was called, was commanded to appear before the Russian draft board to be inducted in the Czar’s army. This fate was tantamount to both a spiritual and physical death sentence. “As the date of his appearance neared, his father, Rav Chayim Brisker, instructed him to concentrate on the above passage from the Nefesh HaChayim. To Reb Velvel’s great relief, his meeting with the draft board came, and he was exempted from the draft. “Just once, Reb Velvel was distracted and his mind wondered onto another thought. Immediately, as if from nowhere, an armed Nazi approached him threateningly. In a flash, Reb Velvel collected his thoughts and focused on the Nefesh HaChayim and the Nazi moved on. Rabbi Yosef Leib Bloch of Telshe explains that natural forces which threaten mankind can be compared to a vicious dog with a long leash tied to its neck. When the animal pounces, the only way an intended victim can save himself is by calling to the dog’s master, to restrain the beast. If the victim fails to recognize the presence of the master then he is truly in grave danger. Similarly when man fails to perceive the “leash” upon the forces of nature, he indeed places himself at their mercy. Hi Chana Jenny, thank you for this wonderful post. Is it possible to get this prayer/ segula with vowels or an English translation? this is truly a secret to keeping afloat in the swirling waves of life. chana jenny, can you provide us with a clear hebrew/english printable version for us to print and hang on the fridge or carry in a purse? I’m not finding a clear version with vowels or English translation (I no longer have the translation I made above, sorry it’s so unclear). thank you. what is unclear is figuring out exactly what words are to be said; just the “ain od milvado” or the whole paragraph that starts with “b’emet”…? the segula is either to say just “ain od milvado” or the entire paragraph written by the Nefesh HaChaim.